The world is over-crowded — this is the message that resounds through the media. This was especially so in 2011, the year the world’s population passed 7 billion. Reports from some international organisations have claimed that farmers must produce up to 70% more food by 2050 to feed the 9 billion people expected on the planet by that date. In short, we have been bombarded with images of scarcity. But this is wrong, for we live in a world of unparalleled abundance. Most countries in Europe and North America waste up to half of their food supplies from the plough to the plate. Whether it’s fresh fruit and vegetables rejected by supermarkets for failing to meet arbitrary cosmetic standards, or manufacturers forced to discard millions of slices of good fresh bread because supermarkets don’t like their sandwiches to be made from the outer slices of a loaf, or whether it’s the waste we all daily witness in our own homes — all of this represents land, water and other resources that could be put to better use than filling rubbish tips with food. The irrigation water used to grow food that no-one eats would be enough to cover the household needs of 9 billion people using 200 litres a day. Food waste also contributes to climate change: in the UK and US, 10% of all greenhouse gas emissions comes from producing, transporting, storing and preparing food that is never eaten. Most importantly, waste food uses up the world’s limited agricultural land. If rich countries wasted less this could liberate agricultural land for other uses — and this applies even for fresh produce grown and purchased within individual nations. If that food wasn’t being bought and wasted, the land and other resources could be used to grow something else, including food such as cereals that could contribute to much-needed global supplies. This colossal amount of wasted food is also a scandal in a context where, globally, around a billion people are undernourished. The connection between food profligacy in rich countries and food poverty elsewhere in the world is neither simple nor direct, but it is nonetheless real. Obviously, the solution is not for rich countries to send old tomatoes or stale bread over to poor countries after saving them from the rubbish bin. This spurious connection assumes that the food in rich people’s homes or over-stocked supermarkets had no other potential destiny than ending up in rich countries in the first place. Cynics will argue that there is no connection between food being wasted in rich countries and the lack of food on the other side of the world. Their argument may have been stronger in the past, when famines were sometimes more to do with local conditions — such as war or natural disasters — than global shortages. But there has long been a connection, and the food crisis of 2007–8 and more recent price-spikes partly caused by global shortages of cereals has made this even more evident. It is now abundantly clear that fluctuations in consumption in rich countries affect the global availability of food and this impacts directly on poor people’s ability to buy enough food to survive. In the UK, 5.8 million people live in deep poverty and this figure is on the rise. Food redistribution charities in the UK have been struggling to cope with the massively increased demands on their services. In 2011-12 food banks fed 128,687 people nationwide, and they anticipate that this will rise to over 230,000 during 2012-13, with 250 food banks currently launched by the Trussel Trust alone. FareShare provided 8.6 million meals in 2012 for 36,500 people each day. But food redistribution charities like FareShare are desperate for more fresh fruit and vegetables to supplement the manufactured foods they have traditionally accessed. Yet, UK farmers often have no choice but to waste between 20-40% of their produce, sometimes even 100%. Most of the time this food is lost because of excessively high cosmetic quality standards and overproduction to meet supermarket contracts. The scale of losses induced by overly strict aesthetic standards was hinted at in the summer of 2012, when supermarkets temporarily relaxed their standards under pressure from the National Farmers Union due to extreme UK weather conditions which meant that UK produce was wonkier than usual. This saved an estimated “300,000 tonnes of produce”, and this is just the tip of the iceberg. The massive potential for gleaning in the UK is illustrated by the US, where extensive gleaning networks already exist; for example, the Society of St Andrews has saved more than 164 million pounds of food for America’s hungry since its inception in 1988. Whether the origin of these cosmetic standards is more the consumer or the supermarkets is an argument to be had. Supermarkets are eager to blame the consumer and claim their hands are bound by consumers’ fussiness and high expectations for cosmetic appearance. Consumer affluence and the cheapness of food are often presented as the root cause. There is also a common perception among retailers that “quality” for consumers is often judged cosmetically, and that even if they say they do not mind less attractive produce, their buying behaviour indicates otherwise. However, there is a mounting body of evidence to suggest that retailers are more to blame for excessive quality standards, such as surveys which show that “consumers are willing to buy heterogeneous produce as long as the taste is not affected,” including a recent one by the Institute of Mechanical Engineers which shows that 80% of British shoppers are happy to buy fruit and vegetables which are not perfect in shape or colour. Food shortages also occasionally force supermarkets to stock more heterogeneous produce. In 2007 around 40% of the UK’s potato harvest was wiped out by extreme weather conditions, and the supermarkets relaxed their cosmetic standards temporarily for potatoes. None of the supermarkets reported a spike in customer dissatisfaction, indicating that consumers were not appalled by the wonky produce. The millions of tonnes of UK crops wasted in this way could help feed millions of people but are instead being left to rot or ploughed back into the land. There is certainly cause for hope though and the solutions are delicious. This level of food waste is a liability from an environmental and ethical perspective but it is a also a massive opportunity to reduce the environmental impact of the UK’s food production while increasing the availability of food where it is most needed and helping alleviate the effects of food poverty. Gleaning Network UK is a new initiative whose aim is to salvage surplus produce from farms across the country. It will do this by coordinating local volunteers, growers and food redistribution charities into a beautiful solution that brings this fresh and nutritious food to the most vulnerable members of society. The act of gleaning is an ancient practice dating back to biblical times and was practiced across Europe in the Middle Ages. It consists of gathering any remaining crop left in the fields after harvest. In the modern version of gleaning, tonnes of unwanted fruit and vegetables are saved in a single day and donated to redistribution charities. 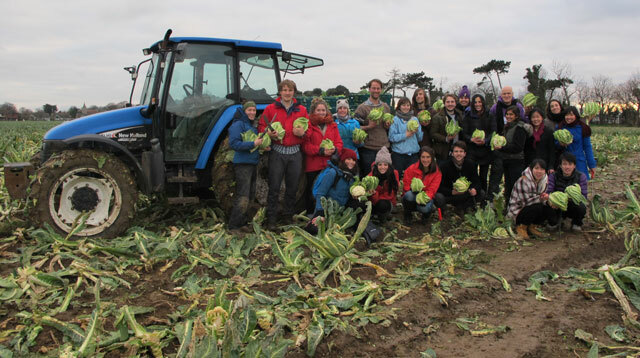 Gleaning Network UK, organised by Tristram Stuart and the global food waste campaign Feeding the 5000, is appealing to farmers across the country to allow volunteer gleaners to harvest their unwanted produce for charity. Several tonnes of fruit and vegetables — enough for thousands of meals — have been saved so far in Kent, Sussex, and Lincolnshire, and new gleaning groups are being formed all over the UK. We have seen whole fields of almost entirely unharvested fruit and vegetables, stretching as far as the eye can see, rejected on the basis of tiny blemishes on their skin or outer leaves that are invisible to the naked eye. A single gleaning day with just twenty volunteers results in salvaging more than 2 tonnes of fresh fruit and veg. At a time of “food scarcity”, environmental crunch points and rocketing prices, this has to be seen to be believed. A small part of the produce gleaned so far was used to cook up a massive curry for the Feeding the 5000 event in London’s Trafalgar Square in November 2011, providing a free lunch for five thousand people made entirely out of fresh ingredients that would have otherwise been wasted. Feeding the 5000 events are now being orchestrated in other cities in the UK and internationally, aiming to build a truly global, positive and dynamic movement of citizens and grassroots organisations against food waste. The massive potential for gleaning in the UK is illustrated by the US, where extensive gleaning networks already exist; for example, the Society of St Andrews has saved more than 164 million pounds of food for America’s hungry since its inception in 1988, saved by over 400,000 volunteers. By 2010, it had a network of 900 growers and ran an average of more than eleven gleaning events, with eight or nine volunteers every single day of the year, with overheads amounting to about two cents per serving. Food redistribution is not the solution to food waste or food poverty. It should not replace deeper structural solutions to these problems nor should it be seen as a substitute for the welfare state. But food redistribution can help save valuable resources in a world where resource scarcity currently hits the poor hardest, strengthen the welfare state, and be part of a radical paradigm shift in food and social justice. Feeding the 5000 was launched by Waste author Tristram Stuart. Martin Bowman is the gleaning coordinator and Niki Charalampopoulou is Policy and Campaigns Manager.